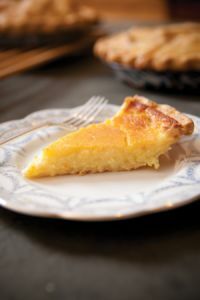 A food historian and time traveler invites us into her 1910 inn, Hillside Homestead, to taste great American pies and talk life transitions. Make these six old-fashioned recipes for the holidays. This Traverse classic was featured in the November 2012 issue of Traverse, Northern Michigan’s Magazine. Get your copy. 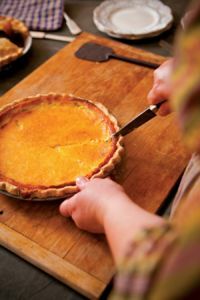 On this particular November afternoon, when a thick smear of charcoal clouds casts a daylong twilight, when drizzle runs in thin squiggles down the windows, and when a chill wind madly flickers the few remaining leaves on the trees, there is perhaps no better place to be in all the North than Susan Odom’s kitchen at her Hillside Homestead inn. 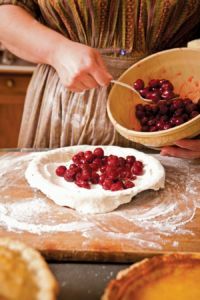 Offsetting the chill outside, the self-taught food historian and pie-crust-obsessed baker is pulling one pie after another out of her wood-fired cookstove. 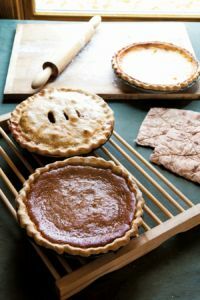 A buttermilk pie, a cream pie, a squash pie, an apple pie, and the pie she calls “the king of pies”—a mincemeat pie. 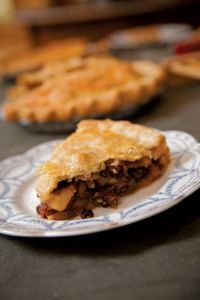 “Harriet Beecher Stowe wrote about mincemeat pie in nearly religious terms,” Odom says, as she sets the brown beauty on the table. 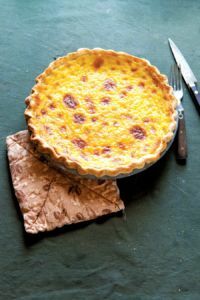 The aroma of subtle woodsmoke and the scents of so many pies whorling in the country kitchen is certainly potent enough to evoke spirits of the past from this circa-1910 farmhouse. And that would be entirely apropos, because not only are Odom’s pie recipes from that era, so is every other thing here. The wallpaper pattern, the paint colors, the Hoosier cabinet, the china pattern, the Round Oak Chief stove, the breed of chickens—Brahmas—that cluck and strut outside in the yard, and, eventually, the pigs she intends to buy this coming spring. She’s been researching pigs, actually. 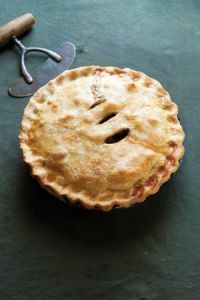 Odom’s pie making and fixation on historical minutiae all fit together in the tourism destination concept that began to form in Odom’s mind back in 2005, and which she opened in July 2011. 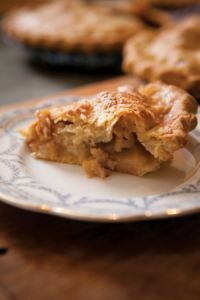 Part history travel, part culinary travel, part agricultural travel, Odom’s historic farmstay, as she labels the concept, is an inn set forever in 1910 in the countryside of Leelanau County. Odom dresses as a 1910 farm wife. 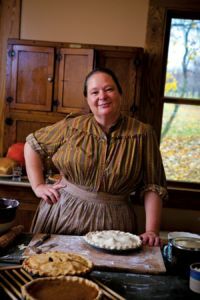 She cooks meals made with foods available at the time (in January, tasty squash sides, but no strawberry shortcake), and she laces history—stories, perspective, facts—throughout when chatting with guests. She also offers guests the opportunity to become involved in daily work if they want to, like feeding chickens, helping cook dinner, stoking the stove. The farmstay concept is more common in New Zealand and Germany, and light work is generally part of the plan, she says. When at Greenfield Village, Odom generally portrayed normal people going about a normal day during a given period. She fetched water in buckets, cooked pies, ate with other interpreters as a family at the table, all while museum visitors watched. “Growing up, I was taught you don’t eat in front of guests, so that always made me a little uncomfortable,” she says. She wanted to share the food, but not just out of politeness. She wanted people to more fully experience the era, and flavor can be a time transporter. And she wanted people more engaged, where they could help with dinner, eat the food, spend the night and touch all the stuff. Want to play the pump organ at Hillside Homestead? Have at it. 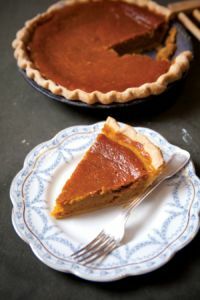 To keep it from being “plain weird,” and to avoid coming off as a suffocating history bore Odom blends her deep historical knowledge with a smart and modern sense of humor, like, say, when she talks about the task-mistress attitude that cookbook writers laid down when instructing breadmakers back in the day. One day she found what she now calls The Beauty Spot. The view is just a mile and a half from the circa 1900 farmhouse that eventually became her home, and is just west of St. Wenceslaus church on Kolarik Road. From a high ridge, the land falls away to deliver a grand view of Lake Michigan and Lake Leelanau. “I got out of my car and climbed up on the road embankment. It was so beautiful I just cried,” she says. She hadn’t realized till then how important it was for her to be surrounded by natural beauty. Historic dinner for your group: 8-person minimum/20-person maximum. $75 per person, includes gratuity, add 6% tax. Individualized menus are arranged during the reservation process. You may book a dinner whether staying the night or not. Know a foodie who loves Up North? Send them the best of Northern Michigan every month with Traverse Magazine‘s Food Lover’s Package. They’ll receive a one-year subscription to Traverse, the Annual Food Issue and a sample of Miracle Blend from Alden’s Mill House. Trust us, you’ll put this spice blend on everything.